Our Graduation Standards are currently being developed and reviewed by our staff, administrators and board of directors. 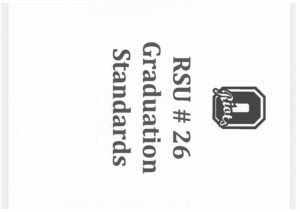 Provided for you is a draft version of the standards each student will need to show proficiency in before being awarded a diploma. For any questions regarding this process and expectations, please contact Mr. Tracy, Superintendent of Schools at mtracy@rsu26.org.